We’re pleased to say that the fashion show audiovisual material is now live on the GSA Archives and Collections online catalogue. This material will be useful for students and researchers looking at many aspects of the fashion shows, including changing styles of garments, set designs and even the students involved. Fashion show films exist for five years, namely 1978, 1982, 1984, 1985 and 1986. The fashion show films can be found at GSAA/AV/1, under the newly-created audiovisual material structure. The pictures below show screen shots of the entry for the 1985 film in the catalogue, which are typical of all the films. There is a description of the film, including themes and styles, set design and show location (where known). The description also contains a soundtrack listing, where the songs could be identified. There is a link to a 30 second clip of the film – if you wish to see the full length film, then please contact the Archives and Collections at archives@gsa.ac.uk to make an appointment to come in and view it. In the creator and subjects sections, you can find a list of all the staff and students identified so far as being involved in the film. Clicking on the name takes you to a biography for that person, covering their time at GSA and beyond. The green camera symbol also takes you to a still image from the film, to give a flavour of the styles from that year. Over the course of the fashion show films, there is a huge variety of styles, materials and colours, shown by this selection of images. The Resource Guide gives details of the material held in the collection which relates to the fashion show, and how the fashion show AV films have been catalogued. 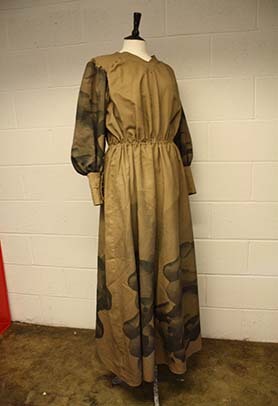 We hold a wide range of material, from posters and flyers, to garments donated by former students. If you were involved with the fashion shows at GSA, we’d love to hear from you. We’ve managed to identify over 100 people involved in the five years’ shows, but if there’s anyone we’ve missed then please let us know. Also, if you have any posters, programmes, garments or other items lurking in your loft, we’d be really interested to see them too. Just drop us a line at archives@gsa.ac.uk. We hope you enjoy reading about and watching the fashion show films as much as we’ve enjoyed cataloguing them!